In room 15, we found many quartz crystals. It is probable that this room, among others, was used for processing this rare and valuable material, which in antiquity was believed to have magical properties. Quartz crystals and offerings made of this material have been discovered in the Idaean Cave and at some peak sanctuaries, indicating that they may have been used in various Minoan rituals. In the Ceramics Workshop, we uncovered two mysterious “lekanes.” There are no parallels in Minoan archaeology. Although they resemble modern juice squeezers, we are not sure about their function. The spout was designed to pour liquids, so we think that they may have been used either in the process of producing ceramics or for squeezing juice from fruits and vegetables. Another idea is that they were used for food production, such as the congealing of milk in order to produce yogurt or cheese. In addition, both lekanes had a hole at the base, which may have facilitated their smooth firing–the hole was likely used to position the vessel on a shaft in order to spin it, like on a potter’s wheel. The potter’s wheel from the Zominthos Ceramics Workshop is one of the biggest found to date, in either a palace or palacelike structure (or villa). It belongs to the well-known typology 3C (according to R.D.G. Evely). Similar wheels have been found at other sites, including Nerokourou, Knossos, Archanes, Tylissos, Gournia, and Zakros. The Zominthos wheel has a diameter of 44 centimeters (17.3 inches) and a slightly projecting rim. On the back, it has seven grooves/ridges and a collar (13 centimeters, 5.1 inches) with oblique cuts. The wheel would have been attached to a vertical axis that revolved around the socket. The potter’s wheel was used to shape round ceramic wares. The principle of the wheel was most likely developed in Mesopotamia. In ancient times, pots were created using coiling, a technique that involved squeezing, squashing, and smoothing successive layers of clay coils into a thin, even wall that swelled or tapered as it grew and formed a shape. To do this, the potter needed to turn the pot around slowly as he worked. Gradually, innumerable ways of using a platter or bowl to speed up the coiling were developed. Eventually, a small turntable was employed, with which a vessel could be turned around quickly and easily. However, it took a long time for free-running, steady turntables to come into use. Among several pithoi that we have found in the Zominthos Central Building, there is a particularly interesting one that came to light in 2007. It took up a great area of the southeast and central part of room 15. It has a height of 1.15 meters (3.7 feet) and two rows of handles below the rim and at the lower part of its body. At the center of the room, and in contact with the pithos’ rims, two thin pieces of limestone came to light that do not resemble the stones fallen from the story above. This probably means that they were used to cover the pithos, which was most likely used for storing liquids or legumes and nuts. We discovered this object in the northwest corner of room 15, near the pithos. Similar objects, which have been characterized as sauceboats, have been found at Akrotiri, Thira. However, we are yet not certain if the Zominthos find had the same use, since it is much larger and undecorated. Any suggestions? These beads, which we excavated in room 19, were most likely part of a necklace. They are special finds not only for Zominthos, but for the Neopalatial period in general. These kinds of artifacts usually come to light in cemeteries, which are quite rare during this era. In the south wall of room 15, we revealed one niche, in which we uncovered three high-stemmed communion chalices. These cups were used as rhyta, since they have a hole at their base through which liquid offerings could be made. These finds may indicate the Central Building’s double use, as a place of worship and a crafts center, an interpretation that is reinforced by site’s location on the route to the Idaean Cave. We found this knife blade in the Ceramics Workshop, near the potter’s wheel and under a very strange base of a vessel that has numerous fingerprints. Although it is not definite that the blade was used in the production of pottery, it is certain that it was used like a modern knife, probably for the preparation of food, since we unearthed a lot of animal bones in the same room. On the other hand, the base of the vessel has no parallels. The fingerprints may have formed a rough surface to be used as a grater, probably for the production of pottery. Any suggestions are more than welcome! We uncovered this rhyton, shaped like a pig, in the niche of room 11. It seems that there are no parallels of this type and, along with the other three rhyta in room 15, it may reinforce the interpretation of the Central Building’s double use as a place of worship and a crafts center. On the floors and walls of the Central Building, we found great quantities of plaster. Many of them have traces of red and blue color, as well as traces of the strings that were used to shape the outlines of frescoes. Their quality is unprecedented for such a building, which supports the notion that Zominthos Central Building had palatial features and functions. In room 15, we unearthed several pieces of pyroluzit (manganese oxide), which has a semi-metallic shine and is mainly found at Lavrio (Attica) and on the island of Melos. When processed appropriately, it can be used to make colors and produce porcelain. The archaeological data in Minoan archaeology, with the exception of Akrotiri and Archanes, rarely present such well-preserved floors from each story. An excellent example at Zominthos comes from room 15, where part of the floor was lying in the upper layers and especially above the pithos found at the northeast part of the room, giving a definitive answer about the original appearance of the floor. I missed the dimensions, but the first thing I thought of was a pattern for making sandals, similar to the wooden feet that guided shoemakers in their craft. What are the dimensions, in inches please? Or was this discovered in an area of the site that dealt with food production and storage? An undecorated items suggests purely utilitarian use. This artefact is about a meter long (45”) and obviously may not have been the most appropriate vessel to be used as a pattern for making shoes. It was discovered in a room where a quite big pithos and other similar pots were revealed indicating production activities and mainly storage. I appreciate your web site. It allows me to view your findings which are very interesting. I was suprised to see the amount of snow in one of your pictures. I assumed Crete would be too mild a climate to snow that much. Keep up the digging I love to read about it. I once was in Samos and after a heavy rain I noticed old pieces of pottery lying in the street amongst dirt from the water run off. Several yards up the hill there was some kind of dismantled temple. It still amazes me that there is so much left to find. Actually Michael you are right. Crete has a mild climate but in such high altitudes (Zominthos is almost 1,200 meters above the sea level), it always snows during winter months, making these areas almost inaccessible for the ‘foreigners’ who do not know cretan mountains. Kymbe could this be a funnel or scoop for large storage jars? That is a really interesting interpretation Carolyn. The time will shows if you are right. Could it have been used as a ‘standard measurement item’..like our glass mearsuring cups..? It was found near food prep..
Photo of kymbe looks like a breadpan I once owned, flat on base with long rounded sides, it made the perfect loaf of ountry french bread. the kymbe what is it made of? could be to wash things like clothes? Kymbe is made of clay. Although theoretically It could have been used to wash clothes, it is open in both sides which means that water cannot be kept inside and also, it was found in a room along with pottery related to food preparation and consumption. Perhaps the kymbe was used as a spout along with a ladle, to transfer liquids from the large pithoi into smaller vessels that could be carried and poured. The rounded end of the kymbe looks like it was made to be open (Bottom edge in the pic seems to be deliberately cut off, made that way), and if the opposite end was also made like it’s shown in the picture (not broken), it would have been simple to hold it against the edge of a pithos with the rounded edge over a smaller vessel, and use a ladle to scoop liquid out. It would have gone quicker than just using a ladle to transfer the liquid from one container to another, because you just have to scoop the liquid into the kymbe and let it fill the smaller vessel. Much easier than calling the strongest man in the village when you needed to pour more oil out of a large pithos! 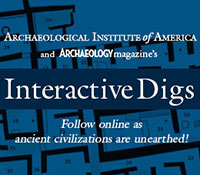 And thank you very much for hosting this dig online! I lived in Crete for 5 years near Xania and I really explored and learned about the Minoans as much as I could, so this is really neat to follow! The Kymbe could it have been used to serve in some ritual? With food or i know the Minoans took various substances? Just found a complete Kymbe in the Santorini Museum, do you know of this? It looks like a ritualistic piece. It may have been used as a ritual, but actually it was found in a room which mostly has to do with food preparation and consumption. However, your idea cannot be excluded. It is true that there is a kymbe in the Santorini Museum. However, we do not have any idea if they were both used for the same purposes? To be honest it is quite improbable. Your interpretation is really remarkable and has a very good point. Probably it is the most well justified answer for this vessel. We all hope that at some point we will manage to give a definitive answer! Re Kymbe Room 15. This looks like a drain to me.Either roof drainage which could have possibly dropped onto the floor. Or even a drainage channel for the floor in the kitchen. These have been found at other archaeological sites such as Malia. Palaikastro.Mochlos. Papadiokambos. Priniatikos and Akrotiri . Was there any more pieces found which would have fitted into it.? Regards from Rita in Crete. Please leave a reply to my e mail of December 3rd 2009 ritaincrete@yahoo.co.uk on the Special finds list. Thankyou. The Kymbe from room 15 is very interesting to me and it leaves me with more questions than answers. The piece being a channel shape would suggest to me that it had a primary use that was involved with liquid movement. I would love to see a replicated cast made of the Kymbe to measure the flow rate of liquid while angled at different degrees to give an indication of what types of comparative sized storage jars this may have been used with. I am also curious if there have been other Kymbe’s found. If this were an instrument of measure, I would think it possible that smaller and larger kymbe’s will turn up, kind of like the modern measuring cups we use today. The left side of the Kymbe in the photo is also interesting. Is there any indication that it was shaped flat or was this piece broken off from something larger? The design is also really cool to think about from an engineering aspect which can give possible solutions to the items use. Next semester I will be starting my studies in Archaeology and I can’t wait to show this to my class mates. I love the site and keep up the great work! Is this piece in tact or is part of it missing? Re Kymbe, in Karenski’s book on Dionysus, there is a photo of a vase, on this Dionysus is holding a Kymbe, while a youth is holding a vase about to pour something into the Kymbe. Unless the kymbe is shown here, fractured with pieces missing, at face value it appears to be a “spout” which may perhaps had been attached to a “suspended” vessel as suggested by Livvy. What intrigues me is the vessel with fingerprints. Potters are well known for making ingenious tools to be used in production of a specific item. Is the vessel’s rim a finished rim (i.e. a thrown rim)? It is interesting that the potter used the crude fingerprint method to flatten and de-air the clay of the base, but went to the trouble of making a finished rim, thus making the vessel perfectly round. I am wondering if the underside is very flat? Also, the dimensions might be useful. Is the vessel large enough to fit snugly over the wheel that you found? My guess is that the vessel is intended to be inverted over the potter’s wheel and used is a bat or banding wheel, most likely a banding wheel since there is only one. A bat allows the potter to remove a pot from the wheel without having to touch its surface, then replace it with the next pot. When turning slowly, it is useful for decorating the pot as well. It can either be fitted over the wheel, or if the diameter of your vessel is smaller than the wheel, attached with a smear of clay, creating an airlock. Thank you so much for sharing your dig on line. Minoan pottery fascinates me, though I’ve never had the opportunity to see it “live”. One of these days I’ll get to Crete! Thanks a lot for all this exiting stuff. Re. kymbe. My question: what does kymbe mean in Cretan or Greek language? And for the fingerprint plate; was the plate over the knife found with the fingerprintside down or up? I am always interested in this kind of seemingly haphazard assemblages. We like very much your idea about the vessel with the fingerprints. Actually, it is quite large, and it seems that it fits on the wheel. Also, it seems that the rim was finished and the underside is perfectly flat. Thank you for sharing your knowledge! The vessel with the fingertips and the knife blade were found exactly as depicted in the image above. Kymbe is a word used for saucieres. Although it has some common characteristics with these vessels, we are still in doubt that it was used like that. John Tackett (see above) provided a nice explanation for its potential use! Thank you for your interest. More amazing finds will come this summer! Costas, What do you suppose the crystals were used for? Could a microanalysis be done on the kymbe to see if anything is embedded in the clay? I’m glad I stumbled upon this site, its so cool to participate on these discoveries! Rock crystals are found in great quantity in the mountain of Psiloritis. However, since they were found in various contexts where rituals were performed, such as in Idaean Cave, it is believed that they also may had magic properties. As far as the Kymbe is concerned we have not done any analysis of the clay so far…However, the composition of the clay seems the same with the other vessels and also, no residues were found on these pots. Thank you for your comments! We have not done any analysis of the clay so far…However, its composition seems the same with the other vessels. Also, no residues were found on these pots to have any indication about their actual use. Thank you for your comments! In a few days you will find new information for this excavation season! Being a bead addict I am fascinated by the beautiful beads shown on the site. What stones are they made from? I missed how old they are thought to be as well. I am very interested in the history of beads and how people decorated themselves with various shaped beads from the seeming beginning of time. The Phoenix ( Glendale), Az. Bead Museum had some very ancient beads on display some months ago. Were only those three found? The other jewelry I saw looked to be hammered, shaped and molded gold, yes? Very impressive! Do you find the patterns and shapes in jewelry repeated on pots and other artifacts, wall decoration and the like? Although I am more a student of ancient Greek language and myth, and a mere novice at archaeology, I will try to make a few guesses as to the purpose of some of these objects. Perhpas the kymbe served as some sort of ornamental rest for a stylus or brush. Since the Minoans had a script and used various pigments, this thought came to mind. It looks a lot like some of the brush rests I have seen in modern times. As for the piece of pottery with the fingerprints, my theory is that it is either a prototype for some new type of artistic style, or an accident. If it is the first, using the fingertips in this way may have been an artisan’s method of adding texture. If it is the second, the creator was making the base and then simply abandoned it for some unknown reason. I lean more toward the first idea, and suggest the second only to leave room for speculation. I may be way off base, but it’s fun to play archaeology detective anyway! Laura M. — Thanks for sharing that. Would have never thought of that, (Kimbe) but makes some great sense. Thanks, Clayton. Wouldn’t it be great to actually be on site to examine all of the artifacts and take in the scenery? I hope that the Linear B script is translated within my lifetime. Am I the only one who think so, or does it look a lot like Egyptian hieroglyphics? Are there any theories out there relating to cultural diffusion, that try to explain why Linear B looks the way it does? I guess that question could pertain to any pictographic script. Hi Laura, I completely agree. It is my impression however that many are trying to date Linear B “to before” ‘glyphics. I by far know absolutely nothing about the writings other than “A” is desiphered, yet nobody can explain “B”. I am just a “self-student” of ancient greek archaeology. I love the subject, and happened across this site last year and have been actively following it. Sorry Jonathan for reversing our A and Bs, thanks. Certain Native American tribes believe Quartz crystals contain the following Powers: They help to heal the mental, physical, and spiritual ailments. Clear quartz contains all colors to help balance, energize and expand all elements to make one whole and fulfilled. They were, and in certain places still are, believed to have the Power to help each of us to find our Inner Light. Perhaps the Minoans held similar beliefs. (and no, I am not in any way suggesting there is any connection whatever between these cultures). There are also recent findings like “lekanes” and “pitharia” at Driros an ancient village located north of Neapolis city . Thank you for your comments and your fruitful discussions! We hope that in the next years we will find some linear tablets as the importance of this building dictates that some kind of administration/organisation and recording should have existed. This year we are going to continue the excavation at this year’s Area 1, where Roman finds were unearthed. Also, we are going to clear the rooms at the northeast part where plaster usually coloured has been revealed in an excellent state of preservation. We will keep you updated as soon as we will make final decisions and arrange things. Happy new year to all! Continue posting your comments and pursuits! Costas, I hope everything is going well there. Thank you for the update, we really appreciate it. Happy New Year to you and the team. Hello Costos. I live in Crete and work as a volunteer at Instap Study Centre East Crete. studying the Minoan Pottery. The Kymbe has been a fascinating object and the suggestions put forward as to what this vessel may have been mostly seem feasable, but have we yet discovered what it actually was ? I think everyone is dying to know. Thankyou for sharing this most interesting site. Thank you for your message. You should definitely come at some point to Zomintos and visit us. The truth is that we have several suggestions for the kymbe, however we haven’t reached any conclusions yet. Do you have any suggestions? Have you seen anything similar? The video from dig was wonderful. My only complaint is I wish it were longer. Is there a documentary in production or that has been made of your discoveries? As for remarks about one or two of your finds, I have always found as many before me that the simplest explanation is usually with rare exceptions the most accurate. I believe this holds true in archaeology especially; with rare exceptions. Since the Kymba was found very near the larger vessel which you theorize held grains or beans, it was most likely a vessel to facilitate the removing of these dry goods from the larger container which you noted was nearly 4 feet tall. Clearly impractical even in those times to compel a slave or servant to up end this vessel whenever needed not to mention the real risk of it being accidently dropped and broken thus damaging or destroying the goods within and the container as well. In our throwaway modern world we sometimes forget that breakage and waste might not be seen as insignificant in other eras. Hence the Kymba. To make removal from such a large vessel easier and safer. If you have discovered or in the future do discover at this site more Kymba I would be interested to know if they are the same size as this one or varying sizes. It does not change my opinion of the use of this paticular find but would expand the definition into this being one of a series of measuring devices and not just utensils to remove some goods from a much larger vessel. As for the artifacts which resemble juicers, again that saying comes to mind. They do resemble very much kitchen items our mothers and grandmothers, and their forebears, used to remove juice from citrus. Such a device in their kitchens greatly speeded up the making of juice before ready mades and concentrates and electric juicers. Prior to this type of utensil, juicing was by hand, squeezing, or with a rheam, digging out, and was more laborious. Since juicers that look just like this have been in use in America and Europe since before the Enlightenment, it’s reasonable to suggest that is exactly what you have here. A juicer. Thank you for allowing a novice and amateur to contribute. This is a very enjoyable and informative website and the queries you solicite from viewers makes for wonderful reading and for thinking upon these truly provocative and breathtaking discoveries.